Sebastien Haller has made an impressive start to life with the Eagles. As the 2016/17 season wound to a close and summer approached, one thing was abundantly clear for all to see at Eintracht Frankfurt: a new striker was needed. The Eagles were the worst side in the Bundesliga in the second half of the campaign, earning just 13 points from 17 games. Long-serving veteran striker Alex Meier was frequently injured and the goals had dried up: Frankfurt found the net just 14 times between January and May and only four teams scored fewer than their final total of 36. Step forward Sebastien Haller. Frankfurt's scouts quickly identified the 23-year-old Frenchman as the ideal candidate, having scored 41 times in 82 outings in the Dutch Eredivisie for FC Utrecht. “It seemed the most logical step to continue to progress and have fun," the former France U-21 international told French publication L'Equipe upon signing. "It’s a combination of things - whether that’s fans, the stadium, the coach [Niko Kovac]; I immediately felt a feeling." That spidey-sense was not wrong, and has helped almost instantly repay the club's faith in him. The striker has started all seven of Frankfurt's league games 2017/18, and has already won over fans with his willingness to embrace the game's physical side. Standing at an imposing 6ft 2in, Haller regularly wins his aerial duels and covers well over 10 kilometres per game. However, Haller is no mere battering ram – even if head coach Kovac once said of him that "a bulldozer couldn't knock him over". After opening his account with a penalty in a 1-0 win over Cologne on Matchday 5, Haller showed he has the brains to match his brawn, scoring an eye-catching sideways scissor kick in the final minute to secure a 2-1 win over Stuttgart on Matchday 7. "It was an instinctive decision to hit the ball like that," he said afterwards. "Everything happens so quickly in the penalty area so you need to rely on your instincts. You don't have long to think about things." 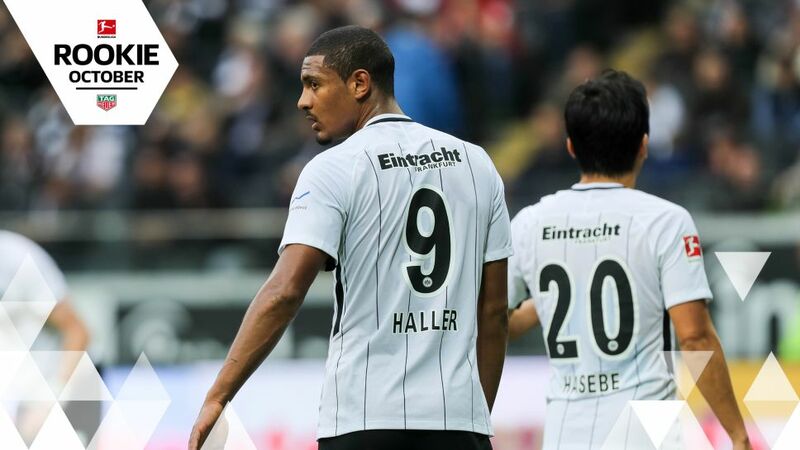 After showing off his ability to produce the spectacular with late acrobatics, Haller has since prove his ability to score late in games even further. On Matchday 11 he had been quiet all game, struggling to work his way into the game as Frankfurt looked destined for a 1-1 with Werder Bremen. Until just before stoppage time, he once again combined acrobatics with late drama. Leaping high at the near post like an insect jumping for prey, opening his body up and volleying the ball into the Bremen net mid-air, arms out-strechted in Karate Kid style. "I just try to work for the team and to make the runs – in the end you get rewarded for that," Haller added. I always try to play as well as possible and to help the team. Ultimately it doesn't matter how I score my goals." The goals did not always flow for Haller, however, and his road to the Bundesliga was a slow and steady one. After being promoted to the Auxerre first team from the club's youth academy in 2012, he struggled to establish himself in the side and was eventually sent to Utrecht on loan in January 2015. Eleven goals in 17 matches later, the Dutch side swiftly made his move a permanent one. Haller has not looked back since, and rippled Eredivisie nets a further 30 times over the next two seasons, while also scoring 13 in 20 appearances for France's U-21s, having previously represented his country at every youth level. Now just a few months into a four-year contract at Frankfurt, Auxerre's and Utrecht's loss looks to be very much Eintracht Frankfurt's gain. Click here to cast your vote for Haller in the September Rookie of the Month vote!